Does your Grange need help?? Congratulations to the members of Wolcott Grange who recognized that the had a problem and asked the members of the State Grange Revitalization Committee to come and help them. There are many Granges in the State who have similar problems and are not able to admit it. We are very fortunate to have two of these teams who are waiting for your call to assist you. Members of the team who assisted Wolcott Grange were Todd Gelineau and Debbie and Jeff Barnes. They made suggestions on what they need to do to get them started on the right path. They will be back to assist when Wolcott decides how they want to proceed. As with anything in this life, it won't be easy. But it is well worth the try. Also present at Wolcott to lend their support were: State Master Robert Sendewicz and Marge. State Lecturer Marge Bernhardt and Carl, Publicity Director; Excelsior Pomona Deputy Jean Meehan and myself. 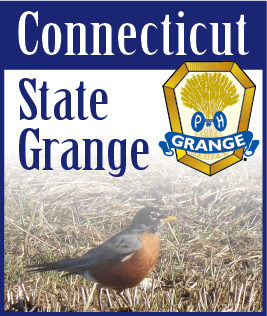 Does your Grange need help?? Give the Revitalization Team or the Membership Committee a call.